Apple introduced Passbook, a new card, coupon and pass managing tool that will simplify your life. This very intuitive feature is directly integrated into iOS and while other apps already offered the same kind of service, as they are not directly integrated into iOS, things don’t look good for them. 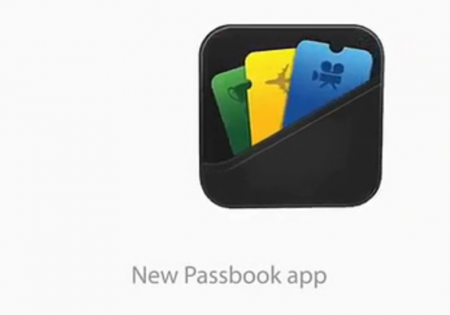 Passbook will be available in the US starting this November and should arrive in France quickly as well. Passbook is a feature directly included in iOS 6. Apple describes it as “ the simplest way to get all your passes in one place.” Indeed, Passbook brings you a very simple way to store all your tickets, boarding passes, store cards and movie tickets in one place and is very easy to use as it makes use of the phone’s GPS and integrates QR codes and a payment system. You just need to login into Passbook, configure it with all your information and start storing in it all the different types of cards you have, such as : Travel tickets, boarding passes, membership cards, event tickets, store cards and coupons. Basically, you store all the cards you previously carried around in your wallet and that’ll be very convenient. As long as you don’t lose your phone. Apple decided to integrate this feature right into iOS 6 because they noticed that users would get confused by all the different apps they had, which, basically, offered the same services but for different brands. The integration into iOS will facilitate the life of both the users and the developers. If you’re an iOS developer, you get access to Passbook for developers, which gives access to the API and to all the tools you need to build a great app for Passbook, using the iOs environment. Through Passbook, the world of mobile commerce will become more accessible to all businesses. A business will be able to start distributing coupons, tickets and cards within a matter of minutes. It will no longer be necessary to bother with complicated cloud infrastructures or sophisticated sale scanning solutions. The way Passbook works is extremely simple. Depending on your position, a notification will pop up on the lockscreen, and automatically give you access to the passes you need in that situation. The geolocalisation that all the retailers were looking for is now directly built in the iPhone. This is incredible because the user will no longer need to download specific apps to do so. You are in front of the movie theater, planning on seeing the latest movie you’ve been dying to see. A notification pops up on your lockscreen, it’s your movie ticket. You slide across, scan the QR code that came up and can then enjoy your movie. And if you’re worried about getting spammed by too many notifications, this is something you can easily configure. When using payment cards, say Starbucks’ card, you can easily see your money balance. Once, you buy something with Passbook, your store balance is automatically updated. If you have a boarding pass, all the information you need, like your boarding time, the time of your flight, your seat number and so on are stored in Passbook. All the information you need is right in your iPhone. As the information in Passbook can easily be updated, this will be extremely useful. No more missing your flight or getting lost in the Airport because your boarding gate changed and you didn’t know. Apple didn’t forget to include coupons in Passbook, and I see retailers jumping at the chance to easily implement reductions in an iOS app, without having to develop a complete application for that sole purpose. Easy and handy, you’ll simply need to click in a retailer’s email to add that coupon to your Passbook. Passbook is also generalising geo fencing, which is the ability to push a message to a mobile phone based on the phone user’s position. With this feature, Apple has removed yet another barrier to creating experiences that consumers demand and that many other companies failed at. Of course, all is not ideal. First, Passbook is only for iPhone users. Apple’s competitors will undoubtedly team up to soon offer similar systems. Also, many brands are apprehensive of the role Apple is taking on. If Passbook becomes a must, these brands will have to rely on Apple to manage their consumer relations and brands aren’t looking forward to that. The difference between the Google Wallet and Passbook. Google Wallet is great. Technology is way better off thanks to the NFC system. The only problem with the Google Wallet is that it required NFC technologies that are not yet well implemented. And it’ll be long before NFC is everywhere because companies don’t want to have to pay for it. While NFC is a great technology that Apple will, I’m sure, make use of one day, for the time being, Apple has played well and has managed to offer a service that everyone could use immediately. A QR code costs a lot less than an NFC installation and are a lot more well known. In that regards, Google was too early.